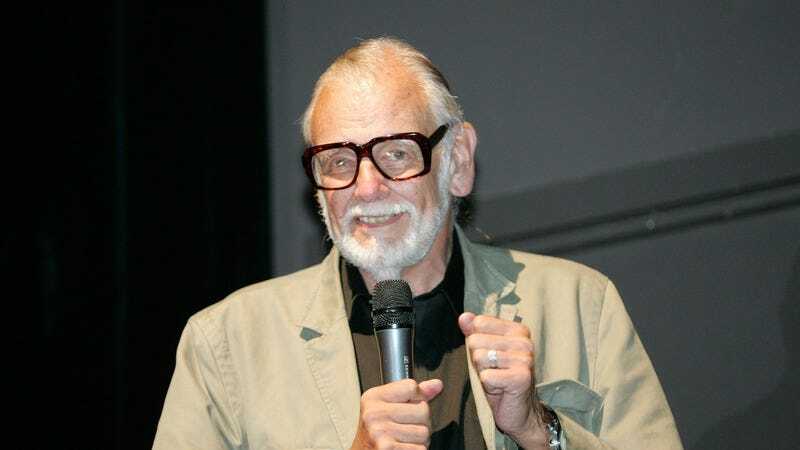 According to The Los Angeles Times (via The Hollywood Reporter), iconic writer-director George A. Romero—director of Night Of The Living Dead and the man who effectively created the modern zombie genre—has died. Romero’s family confirmed to The L.A. Times that he died in his sleep after a “brief but aggressive” battle with lung cancer. He was 77. Romero was born in The Bronx in 1940, but attended Carnegie Mellon University in Pittsburgh and spent a significant chunk of his life in the city. After college, he took on minor director jobs for commercials and short films, but he teamed up with a group of nine friends in the late-’60s to form a production company called Image Ten that managed to raise money for a horror movie that Romero and co-writer John Russo had been developing. Originally titled Night Of The Flesh Eaters, Romero admitted that the story was basically a ripoff of Richard Matheson’s vampire book I Am Legend, but set right at the beginning of the apocalypse instead of at the end. The finished film, retitled Night Of The Living Dead by a distribution company, was a critical flop on its original release due to the level of graphic violence, but it quickly built up steam as more audiences went in knowing what to expect and started to pick up on the film’s underlying themes and messages—like racism and a growing disillusionment with the government and other formerly respected aspects of society. Unfortunately, the distribution company that changed the name removed the copyright notices in the film pertaining to the original title, which later caused Night Of The Living Dead to go into the public domain and prevented Romero from actually making much money off of what had become a huge hit. Romero’s next string of films, including There’s Always Vanilla, Season Of The Witch, The Crazies, and Martin weren’t nearly as popular or successful, so in an attempt to make back some of the profits he lost on Night Of The Living Dead, Romero decided to make a sequel. Titled Dawn Of The Dead and released in 1978, the film and its suburban shopping mall setting were arguably more influential than the first movie in the way they made the central metaphor of the shambling corpses a bit more overt and raised the stakes of the apocalypse by showing its wider effects on society. In 2004, Zack Snyder made his directorial debut with a fairly well-received Dawn Of The Dead remake. After Dawn Of The Dead, Romero directed the motorcycle movie Knightriders, Stephen King’s Creepshow, Monkey Shines, The Dark Half, and Bruiser. He also returned to his zombie series a in the ‘80s with Day Of The Dead (supposedly Romero’s favorite one), and then he revived the series in the early 2000s with the relatively disappointing Land Of The Dead, Diary Of The Dead, and Survival Of The Dead. Romero also directed a commercial for Resident Evil 2—a game series that owes a lot to Romero’s work—and Capcom was so impressed with his work that he was offered a chance to make a Resident Evil movie. Though he wrote a script for it, he later turned down the offer because he didn’t want to make a zombie movie that wasn’t his. Romero is survived by his wife and three children.